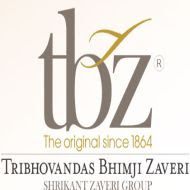 Company's most popular and oldest showroom is located at Zaveri Bazar, Mumbai. This was established in 1864. Along with in-house design jewellery, Bhimji Zaveri also offers jewellery from various parts of the world such as Italy, Turkey and Thailand. It was awarded the 'Readers Digest Trusted Brand Asia' in the category of 'Jewellery Shop' in 2006, 2007 and 2008. As at March 31, 2012, it had 1,192 employees. In Fiscal 2011, its revenue from operations was 11,939.31 million on a consolidated basis, of which 72.51% was from the sale of gold jewellery, 22.08% was from the sale of diamond-studded jewellery and 5.41% was from sale of other products.